Dortmund - is playing his part in penning a happy ending to Jürgen Klopp's final few weeks in charge of Borussia Dortmund. The Australian international once again filled in for first-choice goalkeeper Roman Weidenfeller on Matchday 32 as the Yellow-Blacks moved up to seventh - two points behind sixth-placed FC Schalke 04 - courtesy of a 2-0 home win over Hertha Berlin, a result that could help them qualify for the UEFA Europa League without having to rely on the outcome of this month's DFB Cup final with VfL Wolfsburg. Mitch Langerak: It's cool. It's great not to concede again. I have to thank the lads, though, because I hardly had anything to do all game. In the first half I was only a spectator. In the second half Hertha had a couple of half-chances. They tried to get back into the game, but we managed to keep them out. 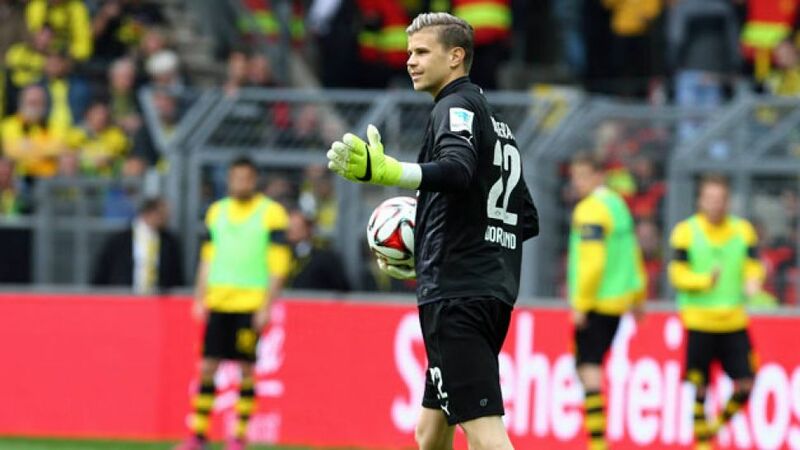 Langerak: It's an amazing result. Of course it's also a bit annoying for us, but we should only be concentrating on ourselves, not other teams. We can't depend on other results. We have to pick up points and win our games. Then we'll see how the table looks on Matchday 34. Question: But is qualifying for the Europa League your goal? Langerak: Of course it's important for the players and the whole team to be playing in Europe next season. I really hope we can do it. We've still got two games in the Bundesliga and the in Berlin to make it happen. Now it's important to focus on our next game. Question: On the subject of the DFB Cup final: What does it feel like when [Dortmund sttadium announcer] Norbert Dickel says he's a bit in love with you? Question: Nobby Dickel caused a bit of a stir on his web radio report of the DFB Cup semi-final in Munich after saying a number of times during the , "Mitch, I love you!" Langerak: (laughs loudly) Oh, that's cool! That's so cool. What more can I say - so cool! Question: Will you keep the No.1 jersey until the final? Langerak: I don't know. We'll have to see how it goes next week. I don't know how it's going to be in the next Bundesliga game in Wolfsburg or later on in the DFB Cup. If the coach says I'm playing, then I play. I try to do the right things in training and then just wait. Question: Does it help you on the pitch to be in such a relaxed position? Or would you prefer a bit more clarity? Langerak: If you know that you're playing every week that's great too, but it's the same for me now. I try to train well, then wait for Friday. And if the coach gives me the nod, then I'm always ready. Question: How high are your own expectations when you've played so well recently to start the remaining games? Langerak: I don't really expect anything in particular of myself. I don't really have a plan for it. In football, each week can change so quickly. I'm delighted with my performances in recent weeks and the good feedback. Obviously I want to keep showing what I can do. But now the only thing that matters is that we all focus on the last three games.